Cascade Lodge has direct access to a snowmobile trail system that offers over 125 miles of groomed trails right at your doorstep, and 140 more miles of state groomed interconnecting trails extending to major destinations like Grand Marais, the Gunflint Trail, Ely, Duluth, Grand Rapids, as well as many others. The system offers something for every rider. Let's not forget about the back country boondocking opportunities that abound in this vast region. From drift skipping on a remote frozen lake at the edge of the Boundary Waters wilderness to exploring remote forest trails, numerous vistas and overlooks will take your breath away! Whether on a casual afternoon ride or all out endurance touring, our trails will always encourage you to ride just a little bit more. The haunting howls of wolves filling the winter afternoon air are sure to send an unforgettable chill up your spine as you take a break with hot chocolate in one of the many trailside shelters. Absorb the silence of the frozen wilderness as snowflakes dance from heaven to earth. And don’t forget ice fishing, our unofficial winter pastime here in the Arrowhead. 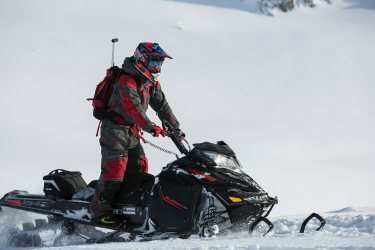 Snowmobiles are the perfect way to access remote fishing hotspots. Toting a portable fish house will greatly embellish your adventure.